If you follow me on Instagram, you've definitely been seeing some photos of my time in Cuba lately. I'm not really in Cuba right now although it chills me to the bone to admit, pun completely intended. 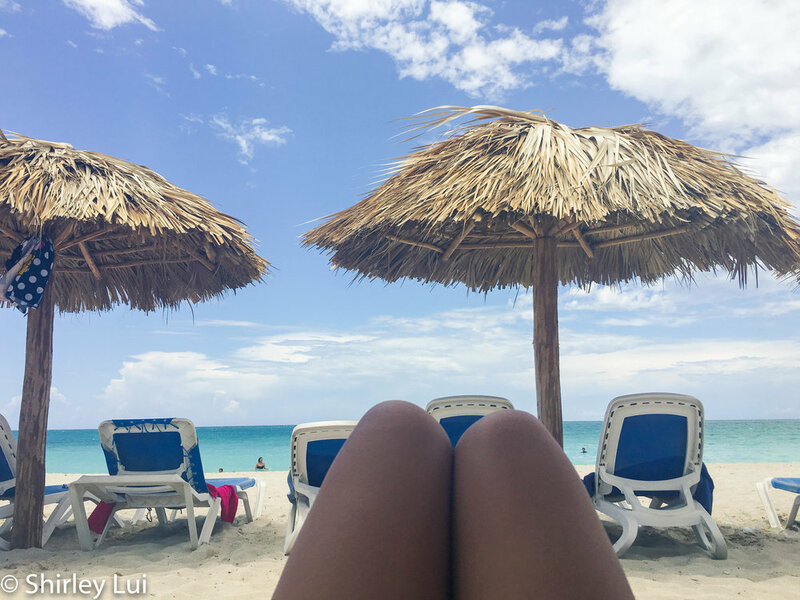 In actuality, I'm many miles away in snowy, cold Canada and dreaming of a not too distant past when I spent a week in Varadero, a popular tourist spot in Cuba, to relax and recharge. It was my first official, do-absolutely-nothing vacation of the year and choosing to lie on a beach away from home was an easy decision. But, when I decided to go to Cuba on my own, even I wasn't 100% sold on the idea. Certain destinations have long been associated with partying and socializing so going solo to Cuba was not originally in my plans. I wanted to go on an expedition or a backpacking trip to Europe but I was already heading to the UK later in the year, and I just needed to get away now. So, the timing was right: I needed to get away and there was an amazing deal to spend a week on a beach miles away from home. Plus, travelling solo and socializing on vacation are both viable options no matter where you go. It really depends on your mood and willingness to meet other travellers. And as always, when conducted safely, you will have the best of both worlds and not feel totally alone on vacation. 1. Remember why you're there. Whether you are travelling solo or in a group, it's always healthy to have your alone time. Remember that you're one of the lucky ones to be able to go on vacation and that all the time you have is completely yours. My goal was to lie of the beach and worry about nothing because when I left Toronto, I also left all the stresses of daily life and work commitments there. I wanted to be worry-free and that included worrying about whether or not I was lonely. Everyday, I was so content and at peace. I came home refreshed with a new appreciation of savouring my alone time. I know it takes a bit of courage to go it alone, especially when you're surrounded by couples and groups. The only thing that I can say from my extensive experience of travelling solo is that most of the time, the only one who notices how alone you are is YOU. And trust me, when you get over the fact that you're on your own, you will come out happier and be more open-minded. I befriended a younger group of girls who welcomed me in their shenanigans, which I happily joined in every now and then. They were all in awe of how I had "the balls" to go on a trip alone. I don't think they understood my reasoning and I think it will come with age when you realize the value of your sanity and your "me" time are so much higher than what you think other people are thinking. Besides, I never felt lonely because I had to option to hang out with the group and dine with other couples and solo travellers. I was never alone, even when I was by myself because I had a good balance and options. 3. Bring a few books. The best companion on the beach (other than a refreshing cocktail) is a good book. You know, the one you've been meaning to read but haven't gotten around to? Yes, that one. Remember to bring it with you because there's nothing like having all the time in the world to read a book cover to cover with no distractions but the gentle waves of the ocean and the warm breeze in the air. 4. Bring only the electronics that you need. It's not realistic to not bring any electronics, #sorrynotsorry. But you can bring just the ones you truly need. Perhaps if you're more of a Kindle reader than a paperback reader, bring that. Or if you just want to lie on the beach and shut your eyes, pre-download some audiobooks. Take long walks and wander off a bit. If you want to stay within the enclosure the beach resort, by all means but wander alone the beach. It's therapeutic. And if you're particularly adventurous, wander out into the city or to a nearby village to experience the real version of the destination's culture. If you are worried about safety, consider booking a day tour with the travel agency. I booked a one-day tour to old Havana that included transportation to and from the hotel but had the option to wander off on my own. It was the best of both worlds because I didn't lose precious hours getting lost and figuring out transportation, and I was able to wander off in the city and explore it on my own. So, travelling solo isn't limited to just backpacking and spiritual retreats. Resorts can be enjoyed alone and is not just a vacation spot for binge drinking and round-the-clock partying. You can do it all, of course. But remember to set aside some alone time just for yourself to appreciate the beauty around you, to practice introspection and to recharge your mental batteries. If you have any tips for enjoying a resort solo that I didn't talk about, feel free to add yours in the comment box below!